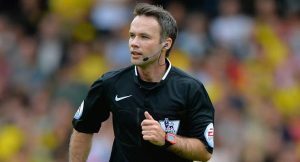 This week’s spotlight for our man in the middle falls on Paul Tierney, who was appointed the referee for the Stoke City v Swans Championship game on Tuesday, 18th September 2018. Interesting Fact: Tierney is a relative newcomer to the Premier League having only been promoted to the Select Group of Referees in the 2014-15 season. Ironically his first ever Premier League game was officiating the Swans v West Brom clash on 30th August 2014.